A sisterhood of survivors becomes a powerful force on the water as they gather Saturday mornings to practice a sport most had never heard of before. Outfitted in bright pink, they don life jackets and pick up paddles, ready to listen to their coach give instructions. Every time the crew takes to the water they deliver a message, one of hope, survival and strength. They are members of Dallas United Pink or DUC Pink, the first Breast Cancer Survivor Dragon Boat Team in North Texas. DUC is a registered nonprofit with a team of survivors, all women, though male breast cancer survivors are welcome. 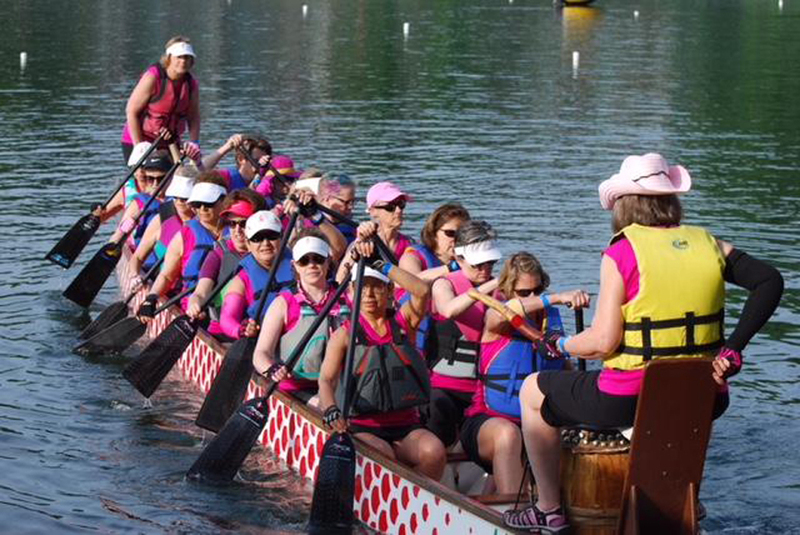 Dragon boating is one of the hottest growing water sports and it just happens to be the perfect therapy for the women on the team who are breast cancer survivors. The sport is based on a 2000-year-old Asian tradition. It involves teams of 10-20 paddlers and a steerperson moving to the beat of a drummer in a 40-ft long canoe-like boat. The Marco Polo World Foundation was the first to bring the sport to North Texas. Eleven years later, the sport is growing fast in DFW. The 2018 season kicked off at White Rock Lake in March and team members from around the Metroplex meet every Saturday morning at 7:30 a.m. at the lake to prepare for the racing season. The DUC Pink team currently has 30 members. Two local women, Sachse resident Debbie Kehoe and Wylie resident Martha Wolf, are instrumental in promoting the team and recruiting new members. Kehoe is in charge of recruiting and Wolf handles sponsorships and fundraising. Coaching the team is Jovin Lim, 14 year paddler and former coach of the DUC Delite team, the premiere competitive dragon boat team founded by UT alumni. Lim became involved in the sport when he was at UT Austin, then he paddled for the Singapore Military Team. Though he has only coached the women for just over a year, DUC Pink team members consider Lim an excellent coach and motivator.